How to Wash Your Hands Poster. User-friendly text and clear instructions show employees how to wash their hands correctly. Durable laminated construction with full colour illustrations. Compiled by qualified health & safety practitioners. 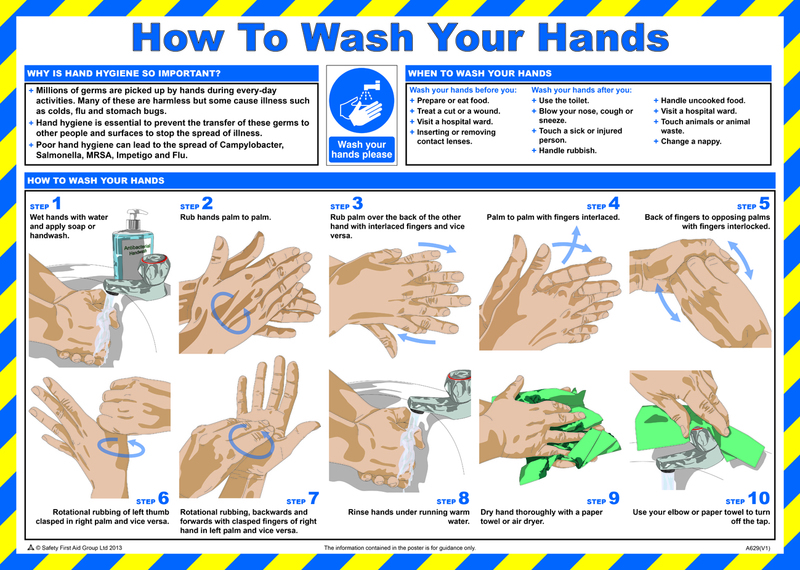 Sign Text: How to Wash Your Hands Poster. Protect Your Employees And Avoid Costly Accidents. This product is an information sign. These signs are used to indicate general messages or info. Safety Poster are used to provide both general and topic specific information about health and safety in the workplace and to raise awareness of safety matters. This product is made from paper encapsulated with laminated plastic protection. This sign is wider than it is tall. Suitable for fixing with self-adhesive tape. 420mm or approximately 17" high 590mm or approximately 24" wide. Interior signs are suitable for use in interior applications. Restaurant signs are suitable for use in a restaurants. Catering signs are suitable for use in a catering / kitchen environment. Farm / Agriculture signs are suitable for use in farming and agricultural environments. Garage / Motor Trader signs are suitable for use in a garage or motor trade environment. Shop / Retail signs are suitable for use in a shop or retail environment. Suitable for mounting on a smooth surface Suitable for mounting on a flat surface. Posters are signs with a larger quantity of information, normally used for general health and safety messages. This sign is approximately equivalent to A2 paper size. Signs in this range are from our standard range. Signs in this range are from our maximum choice range. Giving you the most choice of signs available in the UK. Signs in this range are the most popular choices. We currently have more than 20 of this item in stock ready to be dispatched. This item is available for standard delivery in 3-5 working days. This item is available for express courier delivery next working day.